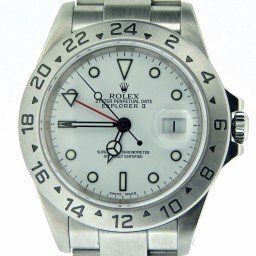 BeckerTime offers a selection of mens used Rolex Explorer II watches in sizes 40mm and 42mm. These timepieces come in stainless steel with Oyster bracelets and black or white face dials. 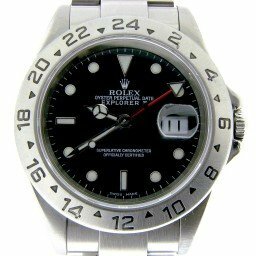 Either way, we are confident that you will find a used Rolex Explorer II that fits your style and budget.  Remember, Beckertime offers a 30-day money-back guarantee and a Lifetime TradeUp Guarantee on qualified items. Also, we strive for 100% customer satisfaction. So, let us help you find that perfect style. Therefore, don’t hesitate to contact us if we can assist you. At Basel 2011, Rolex unveiled an updated version of the venerable Explorer II. The new Rolex Explorer II describes an investment in the future, as well as honoring the past. They originally introduced the Explorer II in 1971 as a watch for cave dwellers. 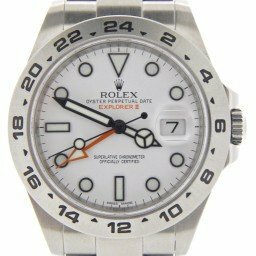 It stood out as Rolex’s adventure watch because the 24 hour bezel could be felt by finger pressure, and the visible bright orange 24 hour hand. The all stainless bezel and the orange 24 hour hand is certainly what made the Rolex Explorer II definitely cool. Unlike other Rolex sport watches, there is not a two-tone, gold, or platinum version. They intended the Explorer II to be an adventure watch through and through. 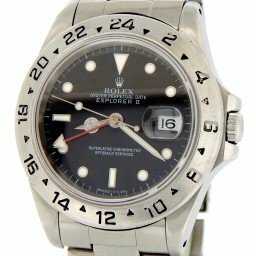 In the early 1990’s, they updated the Explorer II along with the GMT II. At this time they both shared the same 3185 movement. This movement allowed an independently set 12 hour hand. Now the new Rolex Explorer II could track two time zones rather than one. 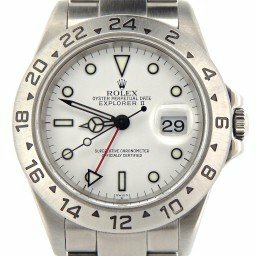 Initially, they intended the Explorer II’s 24 hour hand for cave dwelling to discern whether it was 0700 in the AM or 1900 in the PM. This was also the reason for the bright orange 24 hour hand. Additionally, the 24 hour hand was automatically set to local time. When outside, the 24 hour hand points North when the 12 hour hand points to the sun. When they introduced the independent 12 hour hand with the 16650, the orange hand was no longer needed and ceased to exist. In 2011, all that changed with the unveiling of Reference 216570. This brought back the orange hand and orange lettering on the dial. 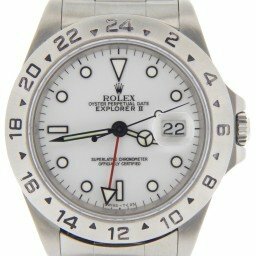 The new Rolex Explorer II 216570 incorporates a larger case and watch face. These increased from 40mm to 42mm. This model integrates larger hands filled with Rolex’s new Chromolite lume and Rolex’s proprietary in-house ParaFlex shock mechanism. Rolex’s updated solid linked Oyster bracelet and clasp with the EasyLink system allowed quick adjustment of the band ½ link. 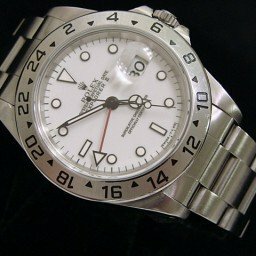 Similar to all updated Rolex watches, there is anti-reflective coating under the date window for easy date viewing. Without question, the Rolex Explorer II describes the development of an adventure watch. The new Rolex Explorer II is available in either matte black face or polar white face and easy to read. Additionally, the orange hands are certainly more visible. The black face model has painted black hands in the center section. This gives a floating hands look, a nod to the original 1971 Explorer II design. 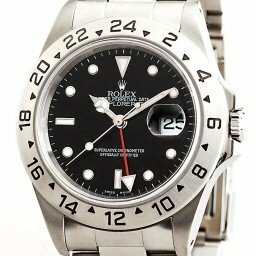 The Chromolite lume is not as bright as the SuperLuminova found on other Rolex models. However, it does glow longer and more often in low light conditions. The Explorer II is a great update and popular choice for the adventurer in all of us. Rolex produced prototypes in 1952 before the Explorer was widely available. These were the Bubbleback models 6098 and 6150. Originally, they had white dials and leaf shaped hands. Upon the release of the Explorer, the references were 6298 and 6350 displaying the now famous Arabic numbers at 3,6 and 9. 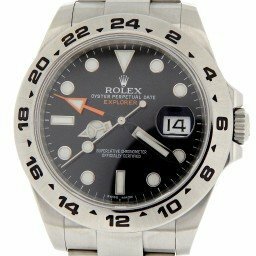 Rolex Explorer history shows that it was after the successful Everest expedition when Rolex finally added the word ‘Explorer’ on the 6350 dial. Most of the early 6350 dials are also unusual in the fact that they are “honeycombed” textured and are signed “Officially certified Chronometer”. They produced reference 6150 until 1959. Subsequently, Rolex replaced this with the 6610, which looked exactly the same, but had a flatter case back due to the new calibre 1030. The dial of the 6610 is signed ‘Chronometer’. 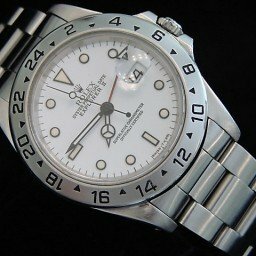 Rolex introduced a new Explorer II in 1985, the 16550. These changes included the sapphire crystal, a caliber 3085 movement with a double bridge, and a white dial in addition to the black dial model. The shape of the hands changed drastically as well, especially the 24 hour indicator which changed from a small red-orange arrow shaped hand to a long and sleek designed red 24 hour hand with a white arrow at the end. This model, in combination with its white dial, had some issues with the paint. The hue went from a white to a creamy color. The black models encountered problems as well, showing cracks in the gloss finish. Some owners thought this was a major problem. They, therefore, had this faulty dial replaced by a Rolex Service Center. Those who did not replace these dials are now proud owners of the highly sought after cream-dial Explorers. Or, in the case of the black dial models, spider dial Explorers. They introduced the new reference 16570 in 1989. However, they occasionally refer to the previous reference 16550 as a transitional model. 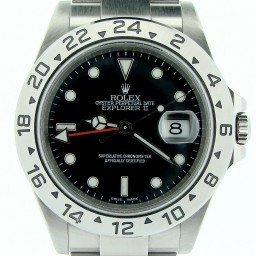 For Rolex in particular, 4-5 years is a very short production time for watches. 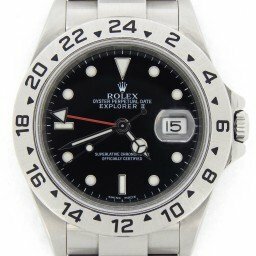 The next iteration of Rolex Explorer history shows that the 1016 had the longest running production period from 1963 till 1989 and was available with the 1560 or the 1570 calibres. Rolex upgraded the bracelet from folded steel links to solid steel, which added to the feel of quality. The new Explorer bearing the model designation 14270, sported a new case, dial, movement, and crystal glass. The hands and the name are the only thing carried over from the 1016. Under this new crystal, the dial featured white gold skeleton markers with luminous tritium fillings: these replaced the previously painted markers. Under the dial was the very latest calibre 3000. 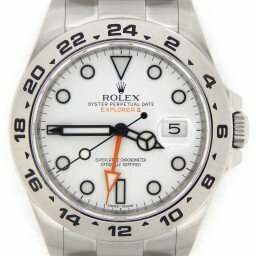 These modifications brought the Explorer in line with all the other Rolex models of the time. Because the cosmetics of the new watch differed so much from that of the old ones, the price in the collectors market for the old one spiraled. 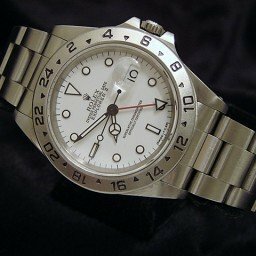 In Fall 2010, Rolex replaced their 14270 classic 36mm with the larger 39mm 214270 which housed a unique Rolex 3132 caliber. All the usual updates to 904L steel parachrom spring are present in this newest edition. 1952 Prototype Bubblebacks Explorer 6098 and 6150. 1959 Reference 6610 replaces the 6150, flatter case back is the big giveaway. 1963 Evolution again sees the ref 1016 take shape with the new calibre 1560 at its heart. 1989 End of an Era as the 1016 comes to an end, 6 months later the new revised Explorer is revealed. Reference 14270 sporting a new case dial movement and sapphire crystal. 2010 A new generation of watches is coming out of Rolex, with the introduction of the use of 904L and also Paraflex in the calibre 3132 fitted to the new 39mm 214270. 1985 16550 is introduced including a whole raft of updates, new sapphire crystal, calibre 3085 movement and an additional white dial option to the original black. Original small red-orange hand changed to a long sleek red one. 1989 16570 released this year with the 3185 and later on 3186 calibre. 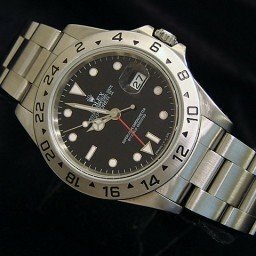 Later editions of the 16570 had the 3186 fitted in conjunction with a ‘Rolex’ rehaut. First use of black outline hour markers. 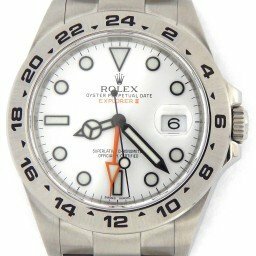 1991 The Rolex Explorer becomes popular!